The HD2 is the lightest of the HD series. 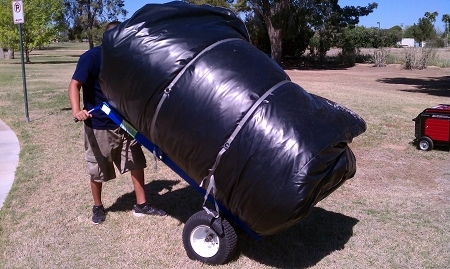 It features two 16 inch tall, 6.5 inch wide tires and has a True 1000 pound weight capacity but only weighs 100 pounds. The tires are 6 ply and have a weight rating of 795 pounds each. That’s 1,590 pounds of weight capacity on the tires. A 795 pound inflatable on the HD2 dolly is only 1/2 of its capacity on the tires and will not even look like anything is on it. 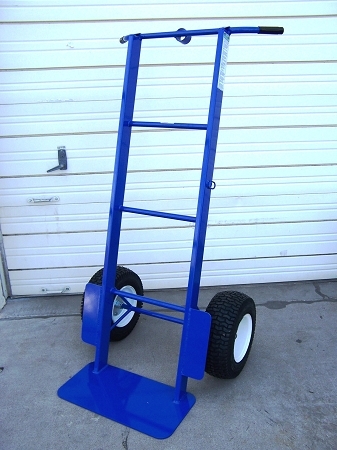 Our heavy duty dollies are in stock ready to make your life easier. The HD2 heavy duty dolly is virtually unbreakable. Moving 400-900 pounds has never been easier. One strong person can pull back and carry 600-700 pounds through grass, rocks, sand, and snow. And it fits through 36" doorways or gates! The HD2 heavy duty dolly is virtually unbreakable and mainly used for items such as Inflatables, Giant Slides, Moonwalks, Boulders. Box Trees, Kettle Corn pots, Large Catering Companies, Marching Band Equipment, Military operations, Fountains and Statues, Design and Build companies, Heavy Construction, Off-Road Truck, and Tractor Tires. The HD2 has a special feature to convert into a utility trailer for easy carrying up trailer ramps and movement across long distances effortlessly. Once you use this dolly you will never know how you worked without it. You must invest in quality equipment for the future and throw away the hay dollies from Harbor Freight and Tractor Supply. We have been manufacturing this dolly since 2005 and have hundreds of satisfied customers. The dolly comes complete with a printed safety manual, instructional video, 2 Plastic wheel chocks to hold the wheels while pulling the load back and a heavy-duty ratchet strap to hold the inflatable to the dolly. This dolly was a very good investment for our company. Were able to haul big water slides with ease and our delivery guys love it. If you need to move large pieces there is nothing better. We do a lot of waterslides on the beach and this dolly has no issues with the sand. Q: How wide is the wheel base? Our ramp is 24" wide and we've ran into issues with other dollies being too wide. A: The wheelbase is 34.5" wide on the HD2. The most popular heavy duty dolly for ramps will be the HD4 because one of the outer tires can hang off the ramp and it will roll on 3 wheels up and down the ramp. Q: can i fit 36" root ball and 1Klb tree on this? A: You would be better off with a large plate HD2 or HD4 for the root ball tree. The regular plate is perfect for box trees.